Nina Stibbe’s prize-winning book ‘Love, Nina’ is being turned into a five part drama of thirty minute episodes to be shown on BBC One. It won the non-fiction Book of the Year award at the Specsavers National Book Awards 2014. Love, Nina: despatches from family life by Nina Stibbe – In the 1980s Nina Stibbe wrote letters home to her sister in Leicester describing her trials and triumphs as a nanny to a London family. There’s a cat nobody likes, a visiting dog called Ted Hughes (Ted for short) and suppertime visits from a local playwright. Not to mention the two boys, their favourite football teams, and rude words, a very broad-minded mother and assorted nice chairs. From the mystery of the unpaid milk bill and the avoidance of nuclear war to mealtime discussions on pie filler, the greats of English literature, swearing in German and sexually transmitted diseases, ‘Love, Nina’ is a wonderful celebration of bad food, good company and the relative merits of Thomas Hardy and Enid Blyton. Season 5 of Game of Thrones is back on Sky Atlantic on 13th April, based on Book 4, A Feast for Crows, and parts of Book 5, A Dance With Dragons. Game of Thrones has large number of teenage actors who are growing up fast so HBO intend to end the show with Season 7 in 2017. Two more novels were announced nearly a decade ago – The Winds of Winter and A Dream of Spring. At the speed G. R. R. Martin writes, plus the length of the novels, it could be a long time before the last one is published. Martin has said the TV show is like a “freight train” barrelling down on him, as he tries to lay track in front of it. The YouTube song imploring him to finish books six and seven, “Write Like the Wind,” is now nearly 3 years old. He insists he’ll be done when he’s done – he may even expand the series to eight or nine books if he feels like it — it wouldn’t be the first time the number of books has grown. So the screen version may beat the book it was based on for the first time in history! Martin told show producers key plot points years ago to cover that eventuality. So he can, if he wants to, write prequels before he finishes the series ….. The final word goes to the author. At the 2013 Comic-Con event w00tstock., the musicians behind “Write Like the Wind,” began to sing their urgent instruction to Martin — who unexpectedly emerged on stage to destroy their guitars. Anyone remember Poldark? Set in 18th century Cornwall with a dashing hero….You do have to be over a certain age to remember it, as it was first on telly 1975-1977. Well it’s coming back to BBC1 as a brand new eight part series. 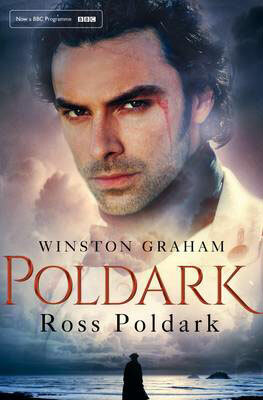 It will be based on the novels “Poldark” and “Demelza,”the first two in the Poldark series. The novels were written by author Winston Graham, and Pan Books are reissuing them to tie in with the series. The new editions are on order and many of Winston Graham’s other novels are in stock. Pan Macmillan will also publish a new edition of “Poldark’s Cornwall”, in which Graham talks about the area that inspired his books. This new edition will be published in hardback on 23rd April 2015. Robin Ellis played Poldark in the 70s series. This time Aidan Turner has been cast in the role. He played Kíli in the Hobbit, John Mitchell in Being Human and Dante Gabriel Rossetti in Desperate Romantics. Olive Kitteridge by Elisabeth Strout has been showing as a mini series on Sky Atlantic. If you would like to read the book, we have a copy in stock. She has a new title The Burgess Boys, also in stock. Here’s the New York Times review by Louisa Thomas from when it was first published in 2008. “Elizabeth Strout brings to life a ‘hardscrabble community’ on the coast of Maine. One story takes place at the funeral reception of a man whose wife has just learned of his infidelity. Another features a hostage-taking in a hospital. Elsewhere, an old lover surprises a lounge pianist, sending her reeling back into painful memories. An overbearing mother visits her wary son and his boisterous, pregnant wife. Most stories turn on some kind of betrayal. A few document fragile, improbable romances. They encompass a wide range of experience. But as the stories continue, a more complicated portrait of the woman emerges. Olive may hurl invectives at her son, but she also loves him, almost more than she can bear. Her husband is a kind man and she loves him too, although she has trouble expressing it. She’s prone to “stormy moods,” as well as “sudden, deep laughter,” and she harbours a sense of compassion, even for strangers. BBC2’s six-part adaptation of Hilary Mantel’s Tudor novels Wolf Hall and Bring up the Bodies has been filmed and the BBC is convinced that the drama is going to be a hit.